To properly compensate your business development center, you must set expectations for your manager and agents and design a pay plan that will motivate and reward them. The proper pay plan can mean the difference between failure and success for your BDC. If you overpay, the return on investment won’t make sense to you. If you underpay, it won’t make sense to your agents or their manager. ROI aside, your BDC pay plan must inspire your team to perform. It should foster team chemistry and growth, and compensation should be based on merit. So how exactly should you pay your BDC? It’s a simple question with no simple answer. Let’s start with your expectations and work backward from there. If, like many dealers, you believe that an employee’s pay plan is defined by their job description, you are on the right track. So let’s nail down your expectations for your BDC agents and their manager. The simplest job description for a BDC agent is “Create quality showroom and service-lane traffic with effective follow-up and daily appointment-setting practices.” There are two sides to this coin. BDC agents work with active prospects to set sales and service appointments, but they must also maintain existing relationships. BDC agents are both hunters and farmers. If you’re in it for the long run — and I assume you are — the work your agents do to nurture and maintain your database and offer individualized service to your customers is just as important as answering the phone and writing quality responses to Internet customers. With that in mind, let’s start by setting a reasonable hourly wage. If you’re in the Midwest, it could be $8 an hour; in northern New Jersey, $14 might be more reasonable. It varies that much. Bear in mind that the number you choose won’t be a secret for long, so be sensitive to your other hourly workers. A significant wage gap between them and your BDC agents can lead to conflict. Next, when incentivizing your agents, don’t just wing it. Back into the right numbers by looking at your lead count and the quality of your leads. Apply your expected close rate to the opportunities and see what that does to the payroll. 1. You must track the leads carefully. Customers have been known to show up at the dealership after reading or listening to a particularly compelling email or voicemail. That’s a real skill, and agents should be recognized for it. In the first quarter, we found that about 15% of Internet traffic was represented by an “unappointed” show. But if the customer doesn’t mention the email or voicemail, and the person who greets them doesn’t ask, the agent is out of luck. 2. 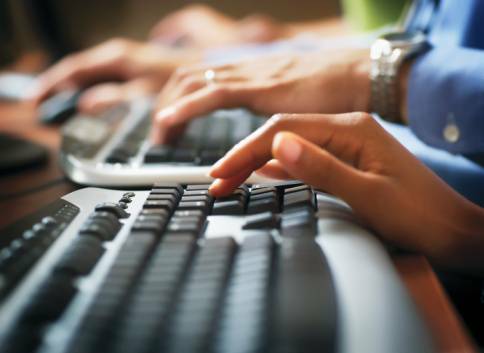 Agents may spend too much time tracking down information. They shouldn’t have to comb through records to look for deals they may have missed due to duplication or a spouse’s name being used in a transaction. The BDC manager should monitor CRM input. Look for ways to simplify tracking and reporting. Remember the first line in the job description: “Create quality showroom traffic.” The close rate on unappointed shows is 42% — quality traffic indeed. If you factor this metric into your pay plan up front, it won’t be a point of contention in the future. But bonus-based pay plans are not the only option. In our own call center, we stick to an hourly wage that’s aggressive for our market. There is no bonus structure. Instead, we frequently do spiffs on specific skills or results for a dealer client, typically for a short period of time. One spiff our agents have fun with is a poker game. We put a three-card “river” on the big board. Agents earn cards by scoring high on phone calls or setting a certain number of appointments. At the end of the day, the agent with the best poker hand wins the prize, which could be a $25 gift card, lottery tickets or paid time off. On the service side, focus on volume. Service BDC agents are typically paid a slightly higher hourly wage but earn fewer bonuses. Trying to track bonuses and spiffs for service can be a complex endeavor. I have seen dealers incentivize service BDC agents based on hours or dollars per repair order. Your BDC manager’s pay plan is simple: Set a base salary with an override on what the agents produce. Again, let’s back into the numbers. If your agents are hitting their benchmarks, your BDC manager’s overall pay should be competitive with sales managers or closers. The actual structure will vary from dealer to dealer, but a highly skilled BDC manager should be earning similar income to the people who supervise the sales team. 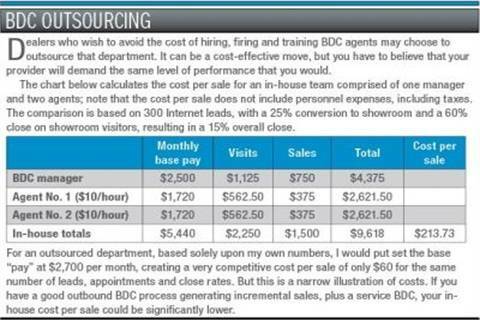 A popular way to pay BDC managers is a monthly base salary, somewhere in the $2,500 range, plus the same bonus as the agents —$15 for showroom visits and $10 for sold customers. Personally, I like to put more emphasis on kept appointments, since that is their job description. The close rate on kept appointments is mostly out of the agent’s control, but they certainly influence the purchase. They can also hinder the purchase by giving bad information or setting unrealistic expectations. If you can identify your lead volume and expected close rate, you will be able to work backwards into a fair pay plan. You also will have earned a healthy ROI and inspired your BDC team to set more appointments and act as good caretakers for your database.